This month, we're adding some much-needed pops of color to your winter wear. I have several vintage coats for winter but this one is one of my favorites. Its a heavy wool 1960s coat with a beautiful collar. I fell in love with the colors when I spotted it at the thrift store and since coats were 50% off that day, I couldn't resist. sandwich the 1 board circle between two felt circles chip board between the felt circles and stitch around the outside. You can do a quick whip stitch. Here I used a blanket stitch. If you don't sew, you could probably just hot glue the edges being careful to trim excess glue so it looks nice. Pull your flowers apart as desired and hot glue the flowers in a beautiful arrangement to make a large boutonniere. The 1940s book recommends violets but you can use anything. 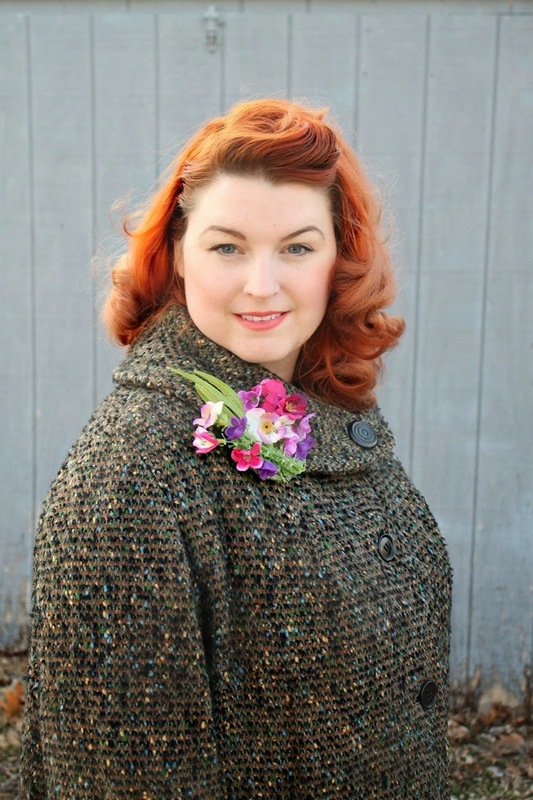 add one pin to the lapel of your winter coat and the other to a muff or handbag. 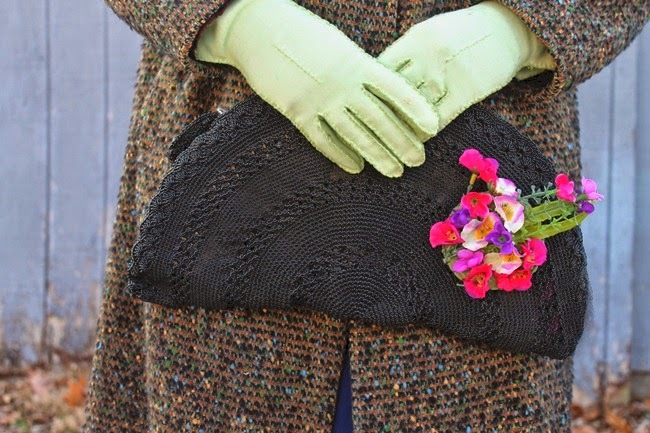 pick up inexpensive knit gloves to match the flowers or if you have some vintage ones in your collection, pair them with your winter coat and hang on tight because spring will be here soon! Stay tuned next month for our 40s Fashion Calendar February project! 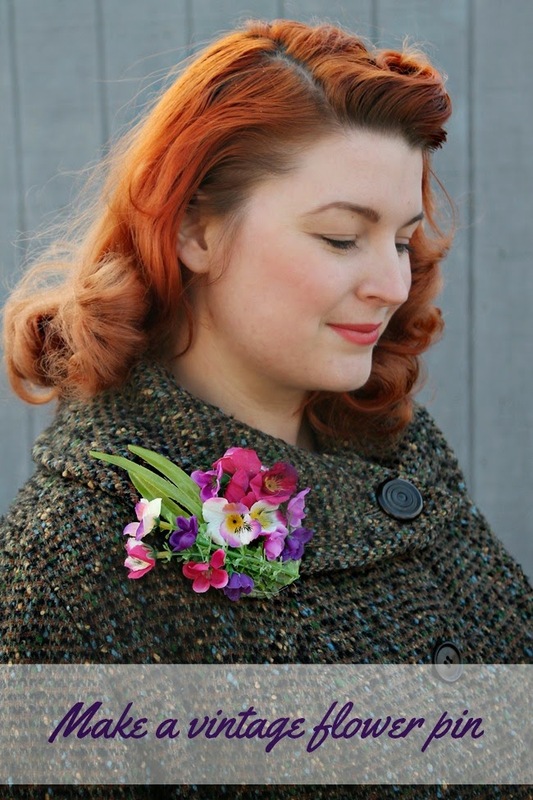 Check out my ebook, Pins for Pin-Ups: DIY Brooches for Retro Girls for more novelty brooch tutorials using things that you already have around the house! I do have one question. I see you cut out four chip board circles and four circles of felt. Do you sandwich two pieces of the chip board between the felt? I only cut out 2 chip board circles. The photo does kind of look like 4 tjough. If you want it to be more stiff, you could definitely do two though! Thank you! Picking up my supplies tomorrow! A lovely little start to the 40s fashion calendar; I hope I can have a go at this soon. Oh this is super cute! I think I'll go pick some flowers up after my classes start! This is such a great idea, honey. Wow!!! I love it to bits. Thank you so much for sharing. My personal budget is nearly nil this year, so anything that I can make and perk up my wardrobe with that doesn't cost much like this gets a huge thumb's up in my books. Thank you again! Thanks! I have a stash of vintage flowers I really need to make something with! What a sweet project, I love it. Thanks for sharing! Gosh, Brittany... I've been gone for a while... and you've been busy! This is a tutorial quite similar to something I've seen as a kid.. and I made a brooch: mixed pearls, lace and flowers.. turned out quite well. This looks so pretty, I will definitely be having a go.